BAKKO Economy Flat Series - 8' x 12' [1-BKB2701-12] - $1,800.00 : Signature Tennis, Your source for Country Club quality products and services for all your tennis court needs. Visually looks like 8' Flat Slimline series. Designed to compete with those who build wood backboards. Each panel contains sound deadening interior (no metal interior frame) and is encased in the same outer fiberglass and gel coat shell coated with Imron paint. Three horizontal rows of pressure treated 2x4s (provided) are mounted to fence post. Holes are then drilled through panels at appropriate heights (instructions explain this) and attach panels with provided green faced bolts. Eight foot high panels. 1.75 inch thickness. Sound deadening matrix interior Encased in think fiberglass & gel coat. 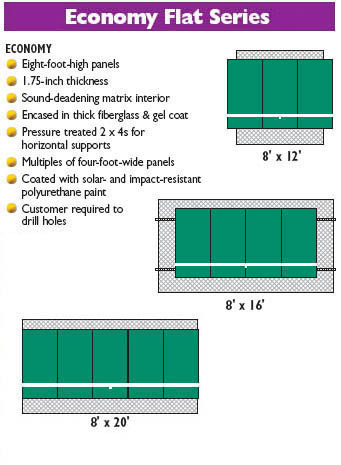 Pressure treated 2x4's for horizontal supports Multiples of four foot wide panels. Coated with solar and impact resistant polyurethane paint. Installation requres drilling holes.